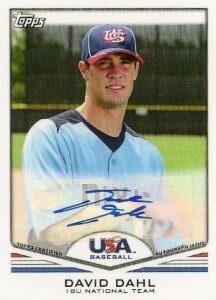 Home » Baseball » What’s in the Cards for the 2012 MLB First Round Draft Picks? 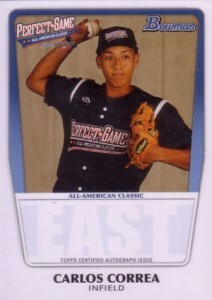 With the first pick in the 2012 MLB Draft, the Houston Astros selected shortstop Carlos Correa from Puerto Rico. For the next several hours, 30 more names were called and the futures of dozens of young men were changed forever. Despite most of these players facing a long road to the majors that will take several years, many of the 2012 first round picks already have baseball cards produced by major manufacturers. In fact, collectors can chase cards from 20 of the 31 first picks. 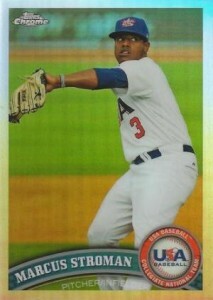 Correa's lone cardboard appearance thus far is in the 2011 Bowman Perfect Game All-American Classic. The card was made for the participants and haven't been inserted in packs yet. It's likely Topps did hold back autographed versions for inclusion in a future set, much like they have done with similar AFLAC sets. Right now, the 2011 Bowman Perfect Game cards of Correa and others currently being sold on the secondary would have likely been acquired from the players themselves. The other main source of baseball cards from the 2012 MLB Draft first round picks comes from the many USA Baseball-themed sets and inserts that have been produced over the last handful of years. Most notable of these are the autographs made by Topps in 2010 and 2011 for Bowman Chrome, Topps Chrome and their autograph-heavy USA Baseball box sets. 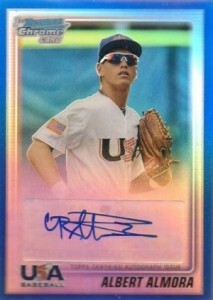 Most recently, USA Baseball cards limited to 199 numbered copies were included in 2011 Panini Limited Baseball. Below is a list of the 31 first round picks from the 2012 MLB Draft. The list does not include any supplemental picks. For each player, we've also included, where applicable, baseball card highlights available at the time of the draft. This is not a definitive list of all their cards as several have extremely rare parallels that have only a handful of copies. Rather, this list includes the players' best cards that are abundant enough that they are somewhat readily available. You can click on their names to shop for deals on eBay. MARK APPEL 2014 BOWMAN INCEPTION GOLD AUTO AUTOGRAPH RC #06 99 !